Okay, I admit it...I am a horibal uhm horrible speller; but I thankfully grew up in the age of computer aided spell checking. Unfortunately, Adobe After Effects never included this feature. Every time a new release was announced I would anxiously await the arrival of this much needed feature...but it never came. I finally decided to take matters into my own hands. I used the scripting functionality in After Effects to build my own spellchecker. The script goes through the currently selected composition, and any precomp contained within and checks every text layer for proper spelling. 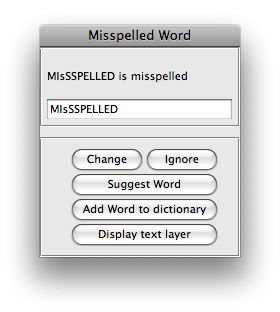 If a word is misspelled, the script will give you the opportunity to enter in the propper spelling or get a suggestion. The spell suggestion comes from my website. I originally had the script come up with suggestions but it was taking nearly 15 seconds per word, so I created a script on my website using perl (which gets the suggestion very quickly). When you click on the suggest button, your computer connects to my website and gives it the misspelled word. The script on my website then gives the spell check script a list of suggestions. Please note that even though this script has a UI, it is installed in the Scripts folder not in the ScriptUI Panels folder. Takes a layer in your comp and breaks it into pieces. You choose the size of the pieces, whether to animate in order or random, and how long you want the transition to take.